The Rare Stuff: Elvis Costello Trainspotter Gap-Plugger Bonanza, Part 1! Elvis Costello Trainspotter Gap-Plugger Bonanza, Part 1! Despite the fact that Elvis Costello has reissued his catalog three times, heaping on bonus tracks with each successive version (though only on the first two albums in the latest batch), there are still those recordings which Costello nuts call "the gaps" -- b-sides, promo cuts, guest spots, compilation contributions, etc. that have not yet appeared on any official EC release. There's a lot of 'em -- see here -- and among them is some work as good as anything the man's done. Which is to say: really, really good. So here are 20 tracks from among their number, with more to follow in the coming days. 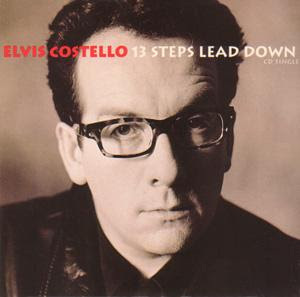 Included here are three demos of the songs Costello wrote for the Wendy James album, and one live version of perhaps the best of those songs, "Basement Kiss"; two live cuts with Richard Hell from a CBGB's show in 1978 (EC only sings and plays backup on "Shattered", however); covers of Paul Simon and Mose Allison; and collaborations with Elvis' great bands the Attractions, the Confederates, the Imposters, and the Sugarcanes, as well as Steve Nieve and the mighty Allen Toussaint. Full details in the comments. I'm afraid that since I just loaded 'em all into a folder and zipped 'em up, they won't be in any coherent order once you open 'em up, but you should be able to sort 'em out. I think some people will be really excited about this post -- I know that if this weren't my blog, I'd be freakin' thrilled to find all these in one place! Believe me, since I had to hunt high and low to round 'em all up. Coming soon are more Costello/Nieve tracks from the Painted By Memory Australian bonus disc, the powerful Attractions version of "Many Rivers to Cross" from the Live for Ireland benefit, plus covers of Randy Newman and Joni Mitchell, and some stunning, though little-known Costello originals! I'll also be posting a collection of interviews with the always-erudite maestro. PS EC's latest release, the legendary Live at Hollywood High show from 1978, is available here. Oh yeah -- you'll notice the recording of "Inch By Inch" has a quick digital flaw in it at one point, that was in both copies of the CD single I've owned, and probably in every other one too. Hopefully one of these days the track will be reissued in some form with that glitch corrected; meanwhile, it's a good enough track that it's worth listening around it! Thanks for the other good stuff, though! wow! Very cool. Thank You!! Keep up the great work. Many thanks for putting together this great set. I eagerly await more volumes! Thanks for putting together all these rarities and making them available. Although I do have some of these, there seem to be more that I didn't already have. Thanks! Thanks BB! If you wanna link your blog to mine I'd be honored. could you reupp this, the link is down! You've got some great EC rarities I would love to get my hands on. Could you repost giving a different non-megaupload link?